I am taking myself on a writing retreat this week with a group of women writers and my writing coach to Taos, New Mexico. I have gathered and learned and had aha moments, and it’s only the first day. In the morning I took a long walk around town and visited a cathedral with a labyrinth… so meditating on some of my “stuff’ at the moment, I walked the labyrinth. 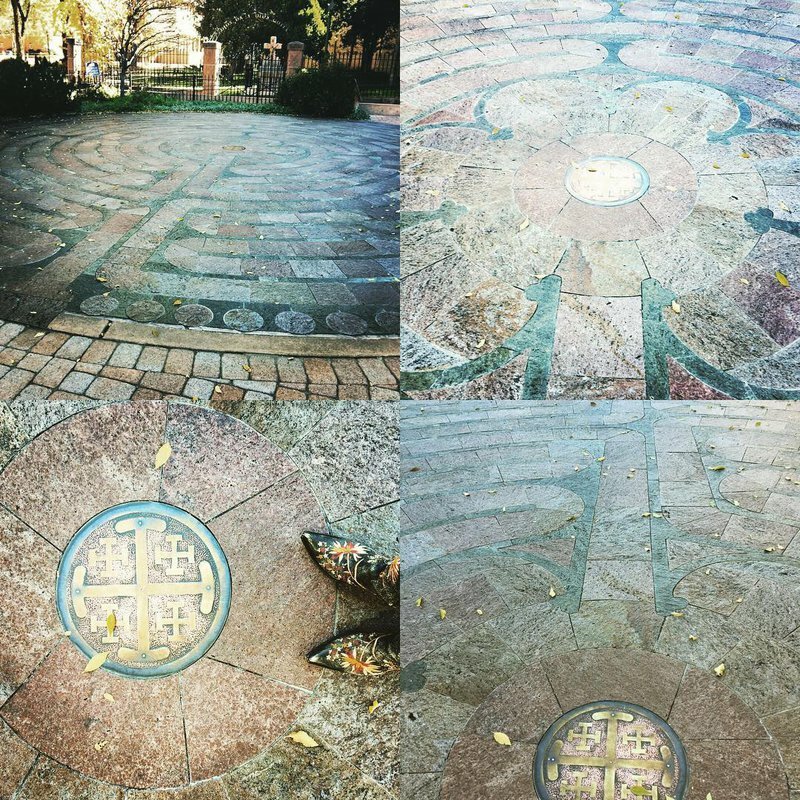 If any of you don’t know what that is, it is a circle of one way patterns, a maze, a combination of a circle and spiral, meant to walk toward the center in meditation. When you get to the center, you can say a prayer, look for guidance, leave a talisman of sorts (rocks, notes, crystals, I even saw a boot at one), and then you slowly make your way circling and circling back out. So, a walking meditation…taking you into your own center, and then back out again. quite lovely. These crazy full days I find myself in, and also many of my clients, is lots of starts to ideas and journeys and new beginnings, but never following through. We live in a world with tons of distractions—you know what I’m talking about! How many times are you in the middle of something and “oh, yea, just got to check Facebook one more time”? Or “ when I get done with this, I’ll get to that.” Or “ time to clean the house," and put off finishing up that chapter or painting. Or how about this one, “Look, another course I need to learn, I’ll buy it now and do it next month”. Ha, how many courses have you bought that you never finished, or started for that matter? Distractions aplenty. It takes discipline just to stay ground, instead of getting pulled away from what we are truly wanting to do, the work we love doing. Procrastination adds into that equation, for sure. This is the biggie though. There are the upsetting moments of not getting the instant gratification or fulfillment of something new that you are trying. Starting your own business is a tough one. Or getting new clients for your growing practice. Wanting to lose weight might top the charts. Or writing a book, or painting a picture, or, or, or… right? It doesn’t go perfectly as planned from the start, so you get upset, or embarrassed, or pissed off. Discouragement and fear are hard emotions to face. This can cause lack of belief in oneself and your dream, or someone else criticizing you, or fear of failure. So you give up, toss in the towel, quit, and then you settle for something less, something not quite what you wanted, but it feels safe. You don’t have to work so hard anymore for something your loved and truly wanted. But really, how does that make you feel? Have you had the happen to you? Giving up. Letting the dream go, not believing you could actually make a living doing that thing. Didn’t think your were good enough, so it failed. So what if it fails? The first time, the fifth time. What is the worst that can happen? You will survive. Really. And you keep on keeping on. If you truly want this thing, if you believe in it, and feel like you can make it happen. Then what stops you? Can you release those fears? Step up into that desire, to see yourself living with authenticity and integrity doing what you love. Practice, perseverance, commitment, and passion, friends! Here’s a recent story. Some of you know that I had a debilitating back injury this year. As a pro dancer, this was scary as hell. The pain and the crawling on the floor were horrendous and full of fear. I won’t go into details but after medical doctors and surgeons, and mega tons of alternative care, some surgical procedures; I knew that I had to face this head on. In the past I’ve dance and worked through minor injuries. But now, with age a factor and pain and future issues even more so, I knew I needed to take a physical break, I’m an incredibly physical woman, teaching dance for 27 years, traveling, working out at the gym, running, gardening, etc. (yes, lots of energy), so for me to call the stops, not sure if I was going to be able to dance again, there was a super high fear factor falling over me. I cancelled my classes, took a leave of absence from the gym and just stopped dancing. I got on this train of healing. I needed to see this through. I did continue to walk everyday, my saving grace and therapy, but I knew my body really needed to rest. And I stayed on that path. After awhile with some gentle physical therapy to keep up some strength, I could manage. My body was going through those changes from being super fit and strong to becoming soft and a bit more rounded. How I hated this feeling. Even gaining weight. This was not okay with me, but I had to wait it out, not push too hard, not re-injure. I needed to follow through and finish up the rest and recovery, so I could finish this ride, and continue to do the things that feed me so much-dancing and teaching, running and being fit, losing a bit of that gained weight, retoning the muscles, and feeling freaking great in this body. So I am finishing up the rest and healing train, with excitement. That’s part of what this retreat is about for me. I finished up the one path of healing and allowing and I’m now on the next train, to rebuilding and moving this body to feel like me again. Dancing and stretching, strengthening, so I feel great in my skin. Now I’m on this new new journey of rediscovery, because this isn’t easy either. It too, is scary, to approach this change with ease, with listening to my body, to not crossing that line of too little or too much. Too follow through when it feels hard, or it hurts, and to stay committed to the vision I have, the desires I want to meet, the end result in clear view. Clarity toward the goal, and knowing why I want that. That’s just one story I have of the different trains I’ve stayed on over the multiple years of running several business dreams, to get to where I am today, a successful lifestyle and creativity coach, with clients who are rocking their worlds, because they stay on their paths too. Plus running a global dance company and training women to own their desires, run their businesses, follow their creative pursuits, and follow through with their passions. Belief in what you want, believing in yourself, being able to envision your desires and goals, to not let old stories, or those dang limiting beliefs hold you down, that is staying on your path. Stepping up to persevere when it gets hard or discouraging or scary, just remember why you are wanting what you want. Continue to build your dreams, to go after your desires, and follow through. Finish what you started so you can live the life you are wanting, to feel successful, abundant, and just plain happy because this is a good life. And be ready for the next part of your life journey. Check out Illumination :: my Women’s Retreat to San Miguel De Allende, Mexico, next April 2019! Illuminate and Create, oh yes! Ready for a coach to guide you to that next step? Would you like to have a free Breakthrough to your Magical Mojo Discovery session with me? Let’s have a 30 minute chat on the phone to see what is next for you, and if I can be of service to help guide you… Click here now to schedule that call with me.